Let's see now. 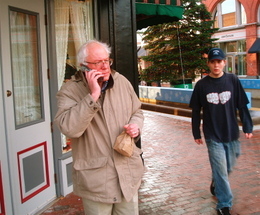 Bernie Sanders [taking a call at right on Church Street] has lived in Vermont since the mid-1960s. Got involved with that left-wing, commie/pinko Liberty Union Party in 1971. First ran statewide in 1972. And it's only taken 37 years for The Burlington Free Press, the state's largest daily, to write a favorable story about the guy! It's titled "Sanders makes impact in U.S. Senate." And Gannett Washington writer Erin Kelly, who has covered Vermont's Washington delegation for quite some time, hit the bullseye in her lead: the fact that the Bernie Sanders you see and hear today hasn't changed his tune one bit from the Bernie you heard way back when. His consistency and his indefatigable persistence are his trademarks. He was the champion of "poor people, working people and the elderly" back then, and he's the champion of "poor people, working people and the elderly" today...."and the environment!" Yours truly first personally encountered Ol' Bernardo in January 1981. Corner of College and Church. He was a candidate for mayor. In March he pulled off the 10-vote upset that certainly shook this town up. My job is to ask the questions the pols don't want to hear. Sorry, but it's my job - a 1st Amendment thing. Use it or lose it! It took us only about 15 years to warm up, but we did! Mayor Bernie was at the helm in Burlington through the 1980s - a crucial and exciting time for change in this old dusty, bedraggled town with a rundown, dirty waterfront. Statewide, he's won landslide victories every two years for more than a decade. Beat Republican Gazillionaire Ritchie Rich Tarrant 2 to 1 to win Jeezum Jim Jeffords' vacant seat. And seeing him today, in the thick of it in the United States Senate, a champion of the have-nots, of "poor people, working people and the elderly" and an effective one, has at long-last won the appropriate recognition from The Burlington Free Press! Bernie's best years still ahead of him? In the Free Press article the paper lists some of Bernie's accomplishments and Bernie's staff list a few. So, he voted on some issues important to Vermonters...the article lists only one amendment that he offered up that was passed. Good God a 16 year old could vote yes on something. I just don't see that as an accomplishment. Not that I think he's doing a terrible job, but not sure he's near as spectacular as "sliced bread". >What do you think? Bernie's best years still ahead of him? Sanders is ineffective in the Senate, but he stays because he wants to fatten up his big congressional pension!!! He would be much more effective as govenor of the state of VT. Sanders is the only politco who could beat Gov. Jimmy D!!! Guess I would have to agree on Sanders not being that effective. How much power does he really wield? Do the Democrates really need him? The Democrates know he will never side with the Republicans against the Democrats. So on a close vote the most he can threaten is to abstain. The Democrates know he will never vote the Republicans on an issue that becomes a political hot potatoe. As a result, he's not all that important to the Democratic party. "The fact that the Bernie Sanders you see and hear today hasn't changed his tune one bit from the Bernie you heard way back when. His consistency and his indefatigable persistence are his trademarks. He was the champion of "poor people, working people and the elderly" back then, and he's the champion of "poor people, working people and the elderly" today.."
And you of all people keep up with that "times are changing" slogan. Doesn't appear that's the case. Not only are things not changing, but they are getting worse and Bernie is the one in charge. If he was accomplishing anything maybe he wouldnt't be using the same campaign slogans year after year after year after year. No what the definition of insanity is ? I guess I've always questioned Bernie's sincerity. Sure he rants and raves, but does he "feel" it or is it just for political gain? A while back he took busloads of people to Canada to get cheap drugs. He said something had to be done. Well, Walmart did it. They are now selling generics for, in some cases, 200% cheaper than Bernie's bus was getting in Canada. Now wouldn't you think if Bernie was really sincere about helping people that he would have held a presser congratulating Walmart on what they've done? Nope, silence on that one. He hangs on to an issue only as long as it makes headlines and then it's on to something else to get publicity. Right now I guess it's global warming that getting him the attention. Since "it took only about 15 years" for you and Bernie "to warm up" to each other, I don't blame the Free Press for not warming up to him. I think a skeptical attitude toward politicians is healthy.